Post-Truth makes sense in a culture which focuses on what we know. An alternative is to focus on what we don't know. 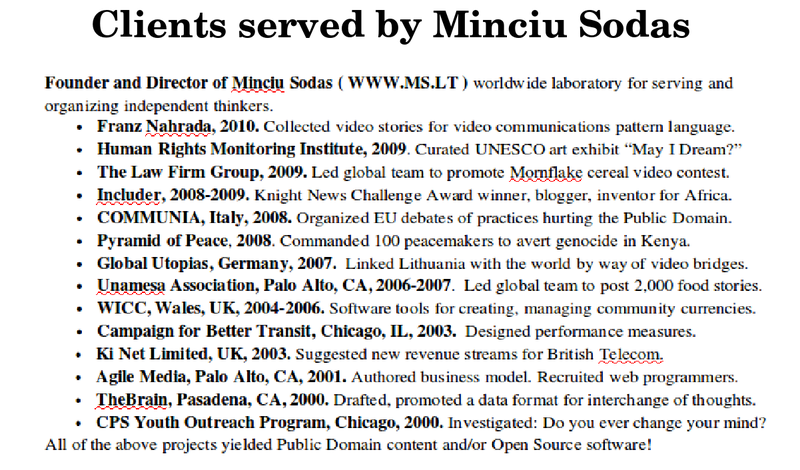 I will describe such an alternative culture which arose in my online laboratory, Minciu Sodas, from 1998 to 2010. Minciu Sodas means "The Orchard of Thoughts" in Lithuanian. It is the name of a business which I registered in Lithuania. My goal was to make my living by working part-time on the Internet, serving and organizing independent thinkers around the world. My business ultimately failed, but unexpectedly, Minciu Sodas came to be known by its participants as having a distinct and, in many ways, positive culture. Key to our culture was my insistence that we always focus on what we don't know rather than what we know. I will tell you about my own characteristics as an independent thinker. 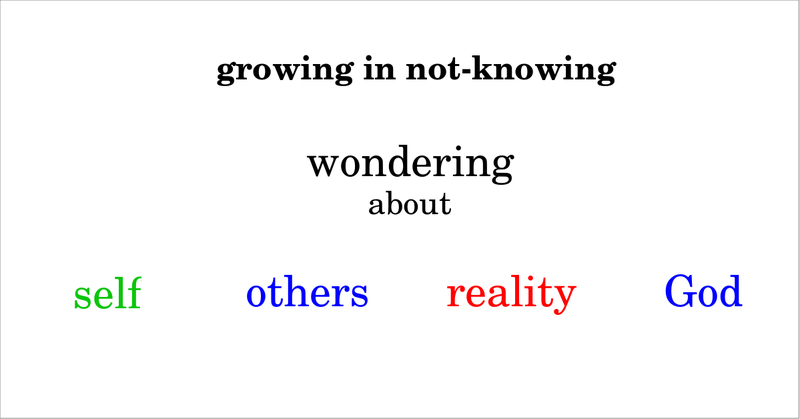 Then I will describe how we can wonder about our own selves, wonder about the variety of other selves, wonder about the reality we share, wonder about God beyond such reality, and in all of these ways focus ever more on what we don't know. I was born in California in 1964 but my parents and my grandparents had come from Lithuania as refugees from World War II. I grew up explaining to those around me that I was Lithuanian and my country was occupied by the Soviet Union. We spoke Lithuanian at home, at Saturday school, at church, at scout camps and at folk dance festivals. Of course, this was very difficult in an English speaking environment. As a nine year old, I realized that it was up to me to choose my culture, and if I was to be Lithuanian, I would have to make every effort to not just speak but to think in Lithuanian. 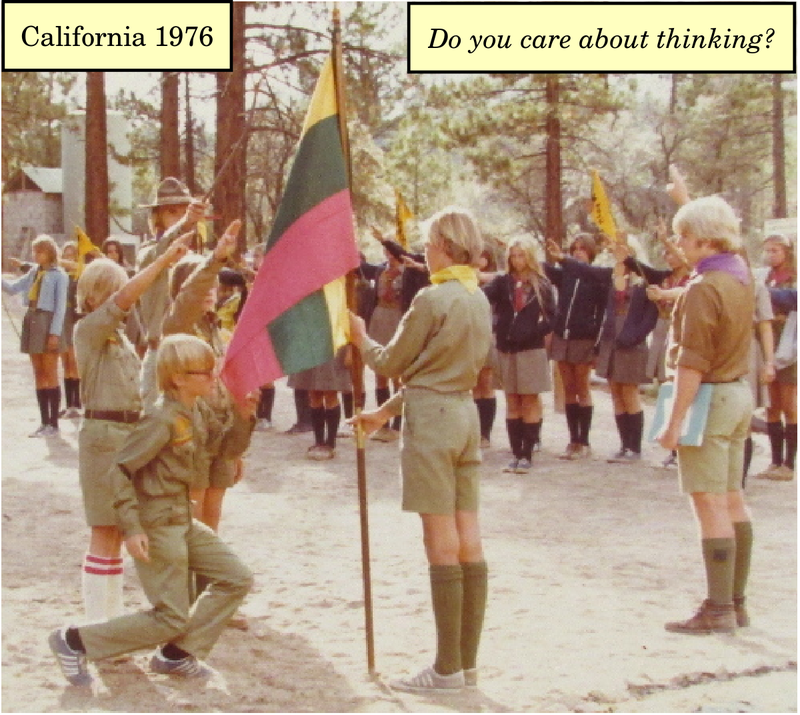 I suppose this inspired the slogan for Minciu Sodas, "Do you care about thinking?" As an independent thinker, my own deepest yearning is my quest, since childhood, to know everything and apply that usefully. 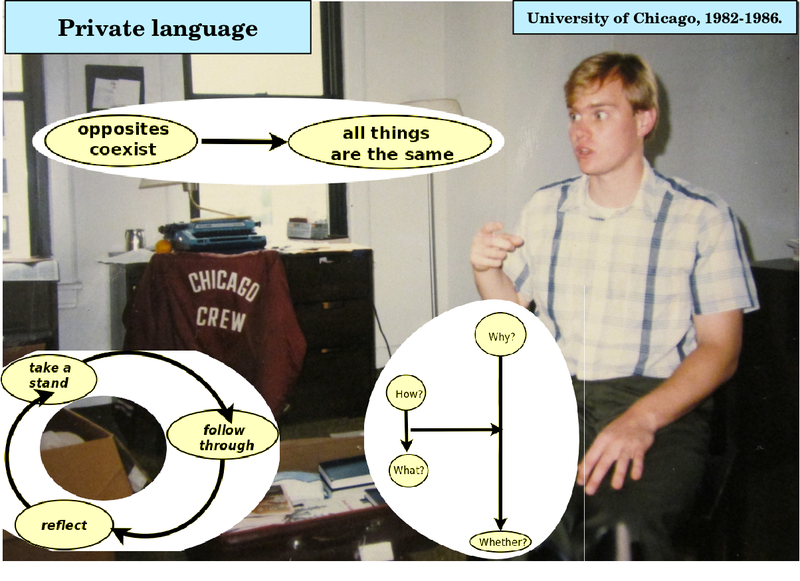 I developed my own private language of cognitive frameworks. I understood that philosophy was an unsuccessful discipline in that there is nothing philosophers have ever agreed upon. Academic philosophers did not believe in the absolute truth which I sought. And a university is a sheltered environment. I could learn more about life by living in a distraught neighborhood, amongst the marginalized. In a wealthy country like the US, I could work part-time as a tutor or programmer and devote myself to my philosophical research. But if I was to do this in Lithuania, a poor country, I would need to start a business. So I decided to serve independent thinkers like myself through the Internet. But the hardest part of any business is finding paying customers and many independent thinkers don't have money or don't want to spend it. Gradually, I realized that I could offer various free services to independent thinkers if they worked openly, in the Public Domain, in an online community which paying customers might ultimately value. I thus invested myself in organizing independent thinkers. At business conferences and other events, I spoke with some three thousand people who I signed up for some thirty Yahoo! discussion groups which I organized. I would ask people what they cared about, and whether they cared about thinking. If they weren't interested in independent thinking, then that would be clear within five minutes, but otherwise we could talk endlessly. Based on these conversations, I can sketch out a general path by which we grow to think ever more independently. The independent thinker thus grows to know themselves but to focus on what they have yet to learn about themselves and others, as well. Thus they are interested in the variety of independent thinkers, and especially the most mature and distinct ones, but every person is of interest to the extent that we are fundamentally the same and yet growing distinct. Each of us comes up with profound questions. As we grow mature as independent thinkers, we recognize the importance of investing ourselves in a culture supportive of our growth. In the mainstream, those who are quick to accommodate each other end up in the center, and those who seek fundamental agreement end up in the periphery. Within the dominant mainstream, a subculture may foster independent thinking if it shifts attention especially to an alternative network of the periphery. The growth of such a network means a growth in our appreciation that we don't know the variety of deepest values and questions that independent thinkers might have. Independent thinkers benefit from an alternative culture which furthers their personal growth by providing moral support, friendship, contacts, a variety of perspectives, shared forums and resources for one's investigations, opportunities for making a living, and an inclusive social framework where one's dreams might grow real. 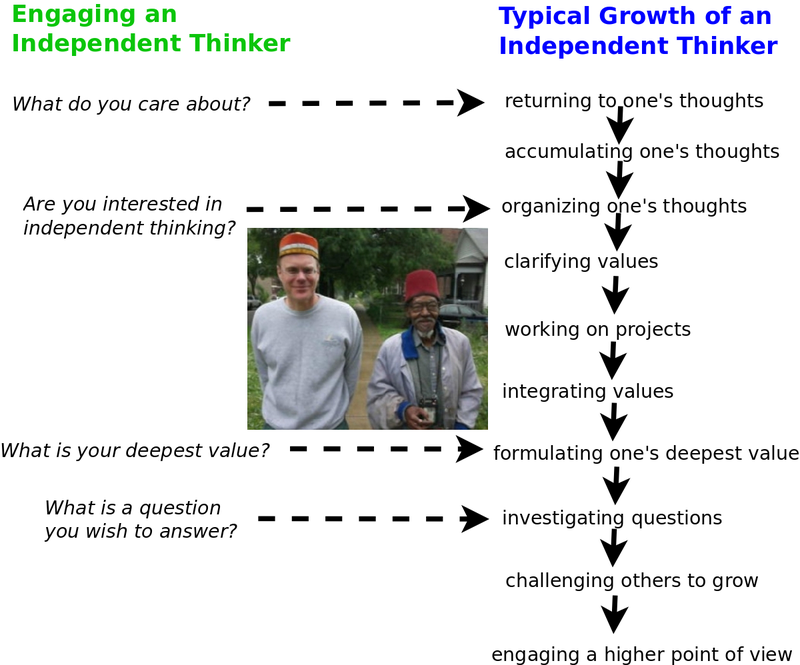 The very concept of "independent thinker" helps them to consider other perspectives as well, to distinguish authentic perspectives, to hold themselves and others accountable for their personal growth. Such a network did not happen spontaneously, as many participants tended to think, but required a lot of investment in outreach on my part to sign up participants, moderate online forums and encourage projects. In fact, I lived on credit card loans and a business loan. I could offer free services to participants if they respected my need to make a living. Our culture depended on three practical principles. First, we worked openly, and our venues were Public Domain unless a particular content asserted otherwise. This policy was great at turning away selfish people because they were unwilling to share their content and let others use it in their own best judgement. It helped discourage needless debate and instead encourage individuals to think out loud and investigate what they don't know. Second, money can bring people together, but you can't pay people to care. 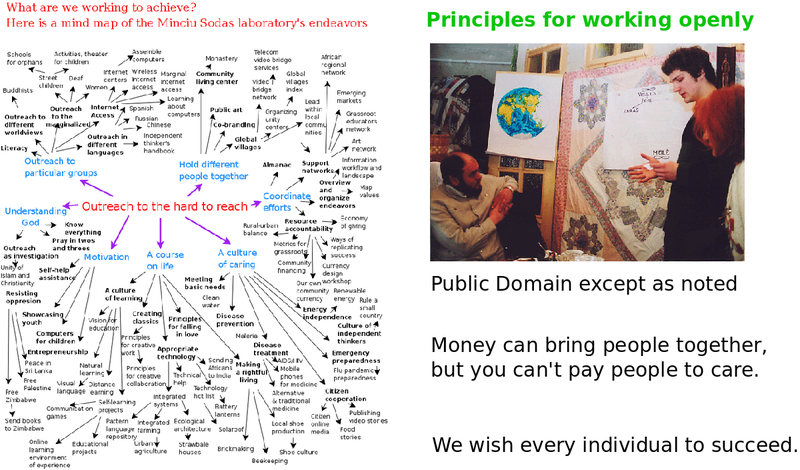 This meant that economic wealth comes from relationships, from including people and organizing them. Participants needed to respect our laboratory as a place for organizing business services. But clients likewise needed to interact with others as fellow independent thinkers and appreciate that they were not primarily motivated by money. If clients were understanding, then we could work for pay on their projects at special rates if we could relate this to our work for free on our own projects. Third, we wanted all individuals to succeed. We sought to include everybody, and we worked for any client and supported any independent thinker who accepted these three rules. 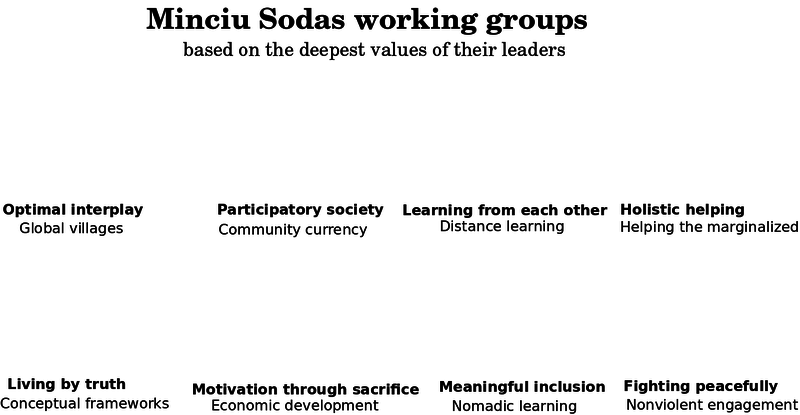 The business model of Minciu Sodas was to encourage independent thinkers to think out loud, to work openly on their own projects, and to help others and get to know them, and thus be ready to work in teams for paid work as it arose, for example, as software developers, content creators or online organizers. My great challenge was to find clients whose private interests might benefit from supporting a public commons. My first attempt was to organize an import/export standard for software tools for organizing thoughts. I got support from TheBrain and MindManager and assembled power users of these products. But my work did not prove useful and I focused on developing an eclectic online environment for investigators to collaborate across email groups, wikis, blogs, chat room, Skype and meetings. I myself worked openly on my own philosophy and several women, Natalie d'Arbeloff, Marjorie Rosenfeld and Annette Robinson, made our discussion more multi-dimensional. 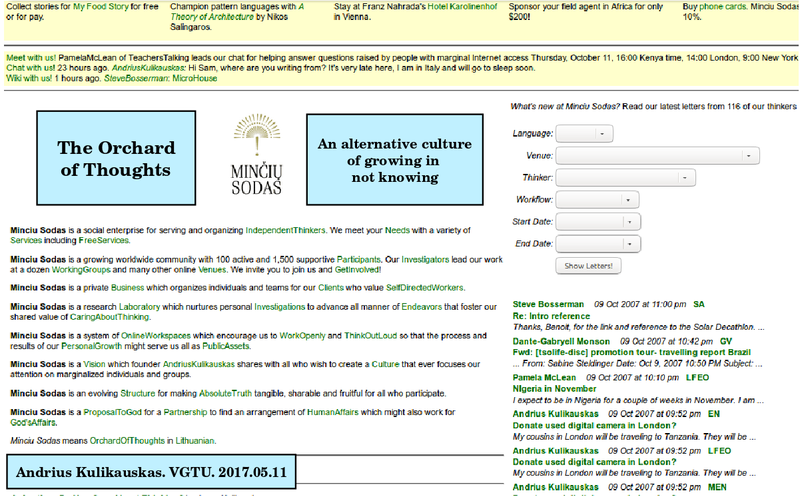 A defining moment for Minciu Sodas was in 2004 when I created a discussion group to support Austrian visionary Franz Nahrada. He wanted us to support his EU projects but I insisted that instead we support him, personally, and so he led our Global Villages group because that was his key concept. His vision of village life as potentially the most nourishing environment was a great inspiration for our online community. Subsequently, I started interviewing our participants, What is your deepest value? and What is a question that you don't know the answer to, but wish to answer? I set up two dozen online groups based on our leaders' deepest values where we worked on related projects such as community currencies, distance learning and regional development. Every person has a unique value which they can lead from and be held accountable to. Imagine if Donald Trump or Vladimir Putin had to focus on their deepest value and were held accountable to that! We valued the widest variety of thinkers, and so we included Pamela McLean, Janet Feldman and the Africans they were helping. I was careful that the poor benefit from their interactions with us. Knowing them as independent thinkers, we could entrust, for example, Samwel Kongere with unusually small research projects of $100 by which he could afford to walk five kilometers and pay $1 an hour to use an Internet cafe. This led to a Silicon Valley client funding our global team with $24,000 to create a wiki, My Food Story. But our most spectacular achievement was the Pyramid of Peace which we led in 2008 to avert genocide in Kenya. We organized 100 peacemakers on the ground and 100 online assistants. Our integrity and fellowship as equals in a culture of independent thinkers allowed us to freely learn from each other. I coached peacemakers to engage hostile youth by "looking at everything from their point of view". I shared seven principles of nonviolence (such as "be vulnerable") which I had grounded in seven metaphysical counterquestions (such as "Would it make any difference?") This helped our peacemakers decide to drive up to the roadblocks on mopeds rather than in cars. Such empathetic principles would be effective with Putin or Trump. Our culture thus adapted flexibly to address new realities. We showed that we could remake our world by challenging ourselves to care for others as equals, as independent thinkers, rather than by applying some novel technology. However, our culture was never strong enough to provide me with regular income with which to pay off my growing debts. Participants would enjoy free services but forget us when they needed paid services. They chose Creative Commons rather than the Public Domain. They flocked to Facebook, which was a walled garden, not suitable for working openly. Participants could feel the value of our culture but couldn't see the importance of championing our principles within their other activities. I ended Minciu Sodas, returned to the US, failed to pay back $130,000 of loans, and declared bankruptcy. I focused on my original passion, my philosophy. I wondered how I might establish such a culture in the future, much like Lord Baden-Powell founded scouting, or Bill and Dr.Bob started Alcoholics Anonymous. 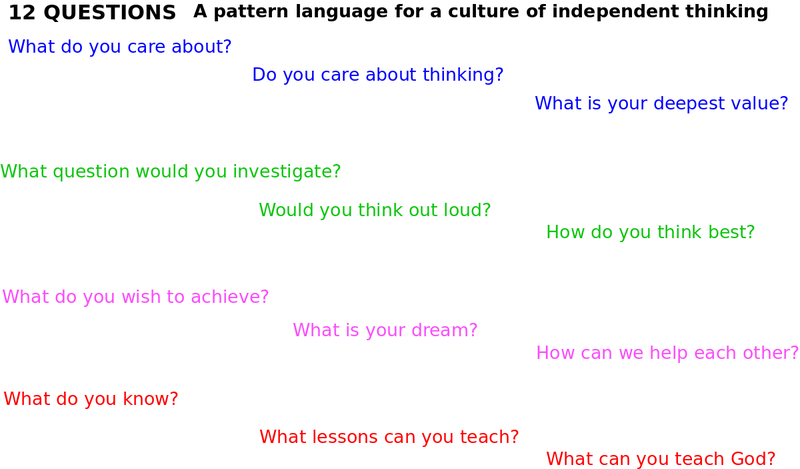 I realized that I could describe our culture with a pattern language of 12 questions that I had asked our participants. Ours was a culture of growing forever, learning forever, living forever, here and now, which Jesus declared as the kingdom of heaven. It was a culture for the skeptical, the "poor-in-spirit", who wished to believe as little as possible, and to make all truth available. It was a culture for the good kid who realized that God didn't have to be good, life didn't have to be fair, and yet we could work together and create a world where what we believe is what happens, an alternate culture so attractive that all would join in. I would focus on teaching people to investigate any question they might have, to apply many ways of figuring things out, to share a conceptual language based on the limits of our imagination. I considered how to raise a family so children grew up in such a culture. Most importantly, I understood that my own devotion to this culture, and my ability to live on the edge, came very much from my personal collaboration with God. Although we humans like to know, yet we truly don't know what we are supposed to do in life. If we embrace Not Knowing as God, then we can think of God as investigating through each of us. Socrates is a symbol of this culture of Not Knowing, the independent thinker who ever more clearly knows all that he does not know.